A Collection of Voyages chiefly in the Southern Atlantick Ocean. Published from Original M.S.S. London: printed for the author, sold by J.Nourse, P.Elmsly and others, 1775. 4° (262 x 210mm). Half-title and two sub-titles. 4 engraved coastal profiles or charts on three leaves, 2 folding. (Some light browning, lacking the contents leaf, as usual.) Modern old-style light brown speckled calf, spine lettered in gilt on two black morocco lettering pieces, dated at foot of spine, blind-tooled turn-ins, by Bayntun-Riviere of Bath. First edition. This valuable work starts with a 19-page preface made up of letters written by the author to Lord North in 1772 in an effort to get government approval and backing for a proposed voyage to the southern Atlantic in search of terra australis incognita: Cook's return in 1775 and his report of the discoveries made during his second voyage rendered the expedition unnecessary. 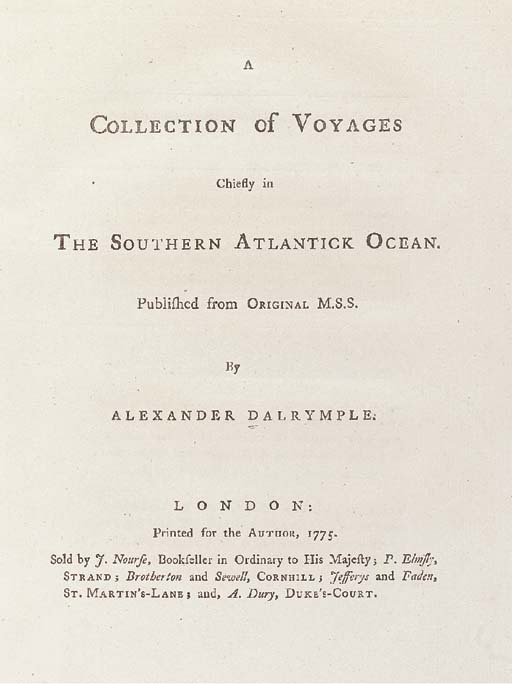 In support of his plans, Dalrymple here publishes accounts of the voyages of Edmund Halley (in 1698, 1699 and 1700), Ducloz Guyot de St.Malo (in 1753), Loziers Bouvet (in 1738-1739) and John McBride in 1766-1767. Sabin 18336; Spence 335.